That’s probably my favorite quote from The Blogging Church, a book I just finished reading (see previous post) about how church leaders can use blogs within their ministries. Although it took me a while to get to it, the book itself is a quick read. It’s easy to skim, which means that whether you’re considering blogging, setting up a blog, or wanting to improve what you’re doing, you’ll be able to quickly jump to the section that matters. Brian and Terry do a great job outlining the important steps along the blogging journey, but what I enjoyed the most were the interviews with pastors about blogging and the last chapter, which is filled with advice from bloggers with many different backgrounds (think marketing evangelists, Microsoft bloggers, and graphic designers). The book is a great all-in-one source for church blogging. That’s its strength and its weakness. Chapters on RSS feeds and podcasting will either help you tremendously or leave you realizing you’re ahead of the curve and already know this stuff. 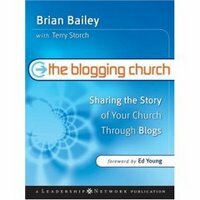 Buy it if you’re a pastor or church leader interested in blogging or considering how blogs could work at your church. It is the primer on everything from considering whether a blog is a good fit for your context to choosing a blogging software to deciding what to write. Borrow it if you feel comfortable with technology and the internet, read blogs, and have a blog but want to grow what you’re doing and hear others’ insights. Honestly, when I started the book I felt like I wouldn’t gain much from it. But I’m glad I took the time to read it. You can learn a lot from simply reading blogs and seeing what other people are doing, but reading the book was like participating in a blogging conversation focused on church leaders. You just pick up new insights along the way without really realizing it. Ignore it if you’re not a church leader or not interested in blogging. It may seem obvious, but The Blogging Church is focused on church leadership. Anyone who’s new to blogging could benefit from some of the talk on how to set up a blog and write with purpose, passion and voice, but there are probably other books that would provide a better primer. In the end, here’s one clear take away: Be authentic. Be passionate. While there are many suggestions on how to blog, the motivation behind the content matters most. The authors mentioned authenticity and passion, and the bloggers they interviewed mentioned authenticity and passion. If you’re going to blog, be real and be you. There will always be a tension between being real and being polished, but in the end, blogs connect because they have a clear voice.